Tire size comparison the easy way before you buy. Use our tire size calculator to compare diameter, width, sidewall, circumference and revolutions per mile for 2 tires. Tire size calculator takes two tire sizes and directly calculates the differences between the tires diameter, width, sidewall, circumference and revolutions per mile. Metric or imperial output available. It also shows examples of your speedometer reading with the first tire, and the actual speed you're traveling if you were to install the second tire. A illustration between 2 tire size and shape are show for better understanding on how it look like. A very useful tool when searching for tires that are a different size then stock. Enjoy this app for all your tire size comparison needs. - With a little explanation it's easy to understand what all of the letters and numbers mean on your tire's sidewall. The numbers are indicators of the size, type, and performance of the tire. - Tire Type The letter "P" at the beginning of the "Tire Size" tells us the tire is a P-Metric tire, referring to tires made to certain standards within the United States, intended for Passenger vehicles. - If a tire size has no letters at the beginning, this indicates a Euro metric tire. P-Metric and Euro-Metric tires may have different load capacities. - The letters "LT," either at the beginning or at the end of the tire size indicate the tire was designed for light trucks. Vehicle manufacturers equip some light trucks with "LT" type tires. These tires generally require higher inflation pressures than passenger tires. - Consult your owner's manual or tire placard for the recommended tire size and inflation pressure for your vehicle. Tire Width is the width of the tire measured in millimeters from sidewall to sidewall. The first three-digit number in the tire size refers to the tire width. For instance, in a size P220/40 R17 tire, the width is 220 millimeters. Aspect Ratio is the ratio of the height of the tire's cross-section to its width. The two-digit number after the slash mark in a tire size is the aspect ratio. For example, in a size P220/40 R17 tire, the 40 means that the height is equal to 40% of the tire's width. The bigger the aspect ratio, the bigger the tire's sidewall will be. Wheel Diameter is the size of the wheel measured from one end to the other. It tells us the size of the wheel that the tire is intended to fit. 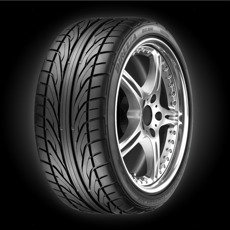 A size P220/40 R17 tire is made for a wheel with a 17 in diameter.